The late, great writer Laurie Colwin once wrote that if she were allowed to have only one fruit in her kitchen, she would always choose lemons (or limes, since they can often be used interchangeably). Any dedicated home cook would agree wholeheartedly. 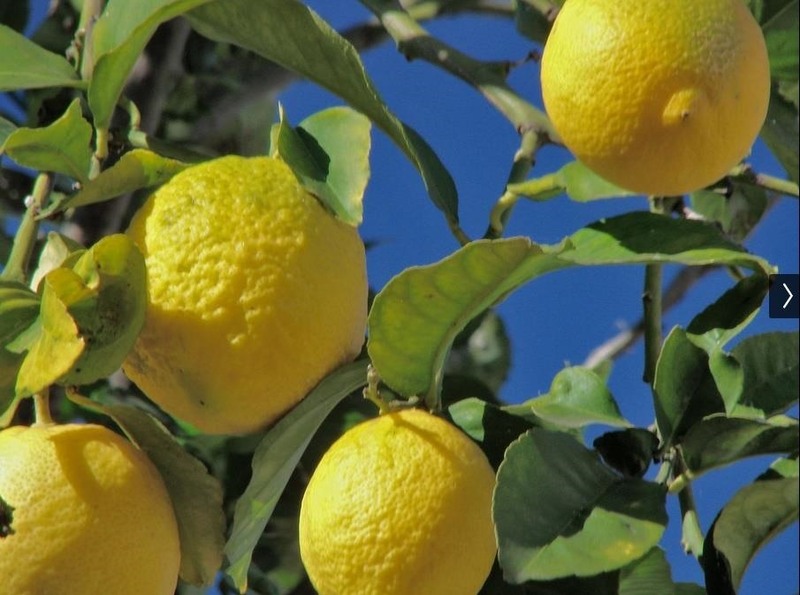 Lemons add dimension to soups, stews, and stir-fries. A mere tablespoon of that golden juice is invaluable in marinades, roast chicken, vinaigrettes, and on fish. In desserts, lemon is really an MVP, whether you like classic lemon bars or rich and tangy lemon panna cotta. The citric acid mimics the savor of salt and the zest from a lemon can make an ordinary entree taste puckish and unique. Plus, lemons are chock-full of vitamin C and have other incredible health benefits, whether it's cleaning your liver or fighting cancer. 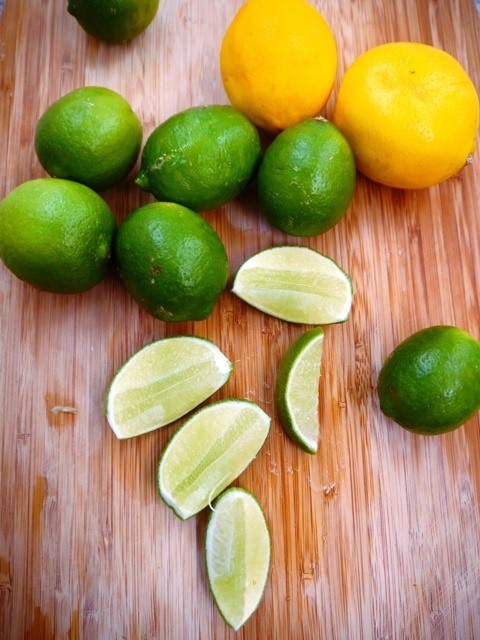 As if that weren't enough, lemons have so many other uses in the kitchen, too. I estimate that I go through about three to six lemons a week, a habit which is easy to afford thanks to my parents' lemon tree and generous neighbors who give me their extras. But while my love of the lemon is wholehearted, my dislike of its seeds is just as large. Having to pick seeds out of your carefully squeezed quarter-cup of lemon juice or biting down on one in your salad dressed with a lemon-juice-and-zest vinaigrette is a real buzzkill. Fortunately, there are easy ways to juice a lemon without seeds that don't require fancy equipment and that require a lot less hassle than traditional methods. Before going on to seedless squeezing, you'll want to maximize the amount of juice that actually comes out. There are many tricks that work for this, including microwaving a lemon before squeezing, or just rolling the lemon on the countertop beforehand, or a combination of the two. Some even recommend freezing before microwaving. Now, back to seedless juice! 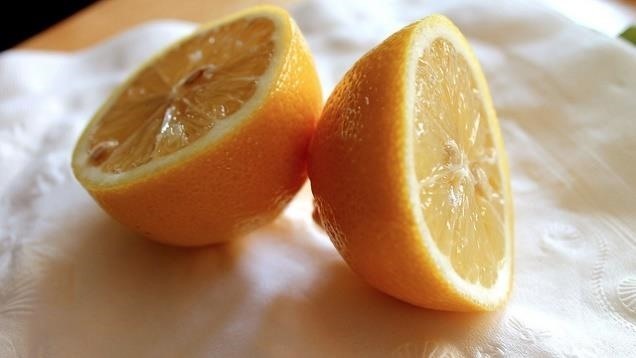 This first method works best when you need only a little lemon juice. 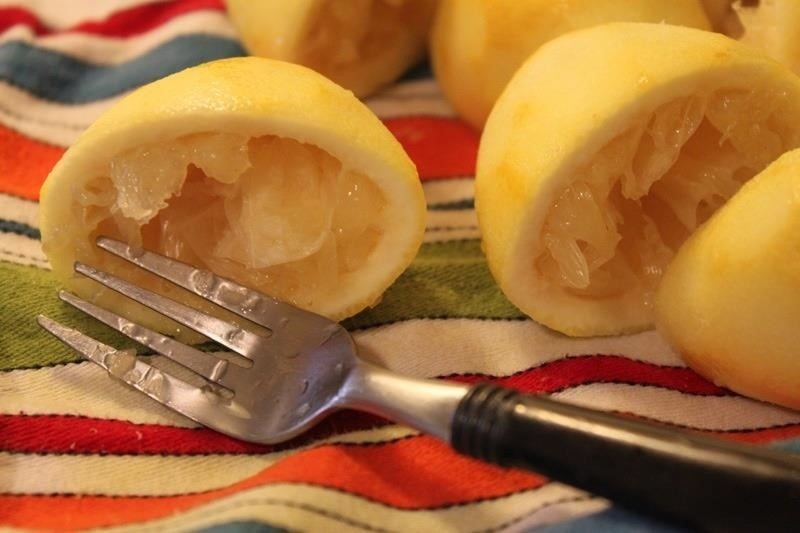 Simply cut away all the sides of the lemon, as if you were slicing around the core of an apple. 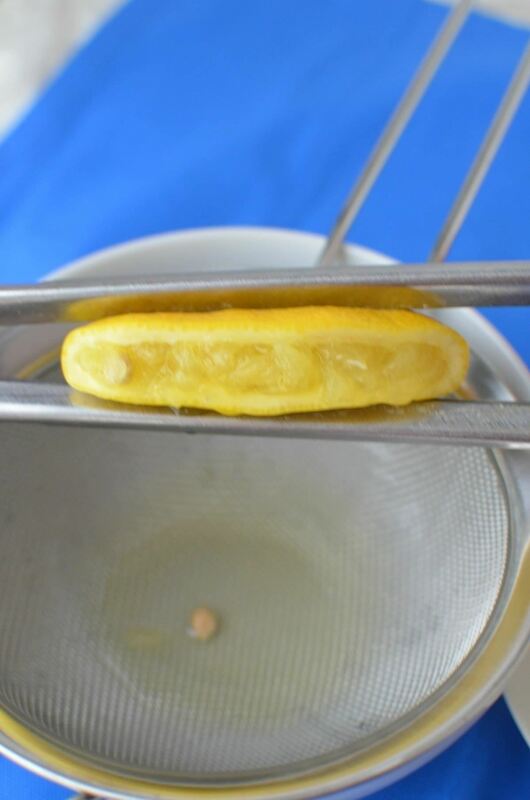 All the seeds will be within the lemon's center and you can use the flat wedges to squeeze over fish or your salad, etc. This actually produces an astonishingly large amount of juice. However, it isn't 100 percent foolproof, so make sure to do a visual check of your wedges before you squeeze. You can watch the video below from Seamus Mullen for a demonstration. Another easy way comes to us courtesy of the country Turkey, where they often bring you lemon to squeeze over your food. 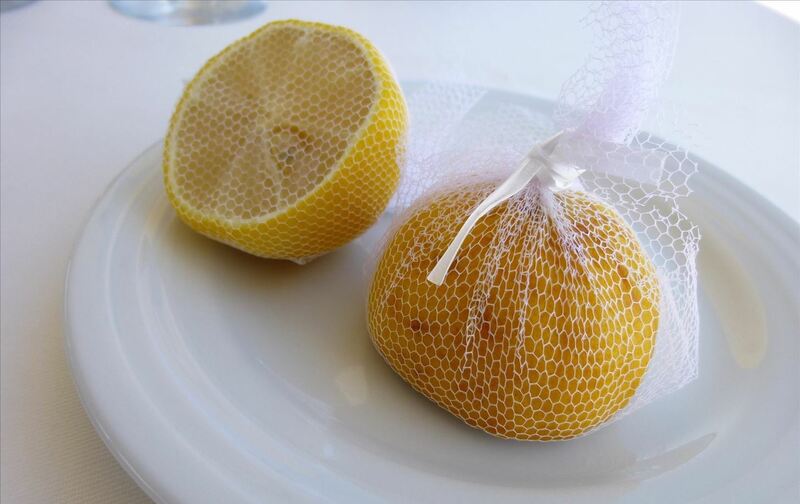 Cut a lemon in half and enclose it in some mesh netting. Tie the netting at the top to form a little bag and squeeze away. The netting should capture all of the seeds, depending on how fine the netting is. You don't have to buy a mesh bag, either: usually avocados, onions, shallots, and yes, lemons and limes, come enclosed in them (I sometimes use multiple layers of this netting, since the size of the gaps can vary). Cheesecloth or a clean mesh gauze bandage work just as well as netting, as do those organza gift bags you get to hold party favors. 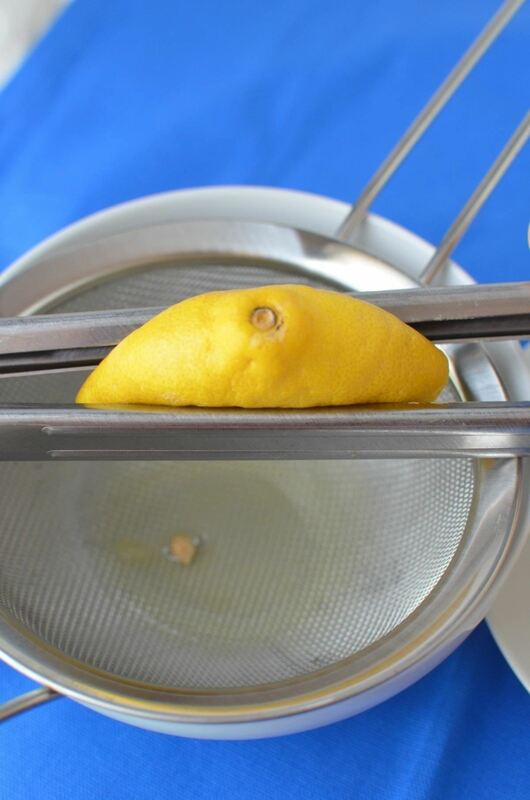 And if you need to get all the juice out of a whole lemon, be sure to check out this hack about how to juice a lemon using an ordinary pair of kitchen tongs. Just make sure you put a sieve under that lemon and presto! You have seedless juice. FYI, you can also use a regular fork like you would a citrus reamer if you don't have tongs. Cut a lemon in half (Gourmet magazine actually recommends cutting it lengthwise), insert a fork into one of the cut halves, and rotate the fork and lemon in opposite directions to yield surprising amounts of juice. A spoon will do in a pinch if all your forks are dirty, but the tines of the fork and the rotating action make sure the membranes of the lemon get broken up and yield all their juice. Again, just make sure you have a sieve or a mesh colander underneath the lemon to strain the seeds and you're golden! You definitely want to use these hacks to prepare for your fruit. But, if you don't mind, or you love pulp, lime me try my trick. I use a pasta strainer with a bowl to catch the juice. 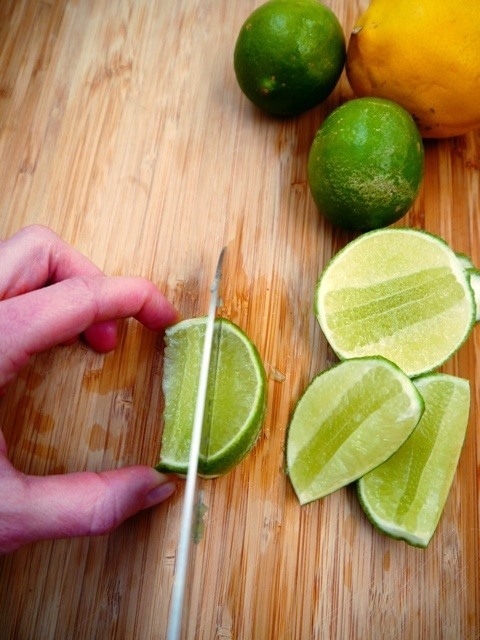 After you cut the fruit, inspect the cut edges for any small pieces of seeds you hit with your knife. Pick these our. The average strainer or colander holes are small enough to catch the whole seeds. Put your fruit open side down on the holes or slits. Then, rub the fruit against the holes as if you were grating cheese. The juice and pulp will flow through. Toss the seeds. Keep the clean peel for potpourri, garbage disposal maintenance, etc.